In the United States society is very different from here in Europe. Instead of living in caves and forests they reside in large scale settlements known as “cities”. These “cities” are home to hundreds of thousands of people, large businesses, and grand buildings – and it doesn’t stop there! They also have smaller human settlements known as “towns”. Some towns don’t have any residents at all. Deep in the Californian desert is a decaying ghost town from a distant era. It stands as a relic to California’s gold rush and all that came with it. Walking through the town can feel like a journey through time. But to do so might put you at risk. You see, this ghost town is not only said to be haunted but also cursed. This is the story of that town and the curse that plagues it. In 1848 gold was discovered in California. When word got out thousands headed to the area to hunt for gold themselves. With a lack of property laws anyone to discover gold in a new area would have rights to it. And so California came to be seen as the new land of opportunity, where anyone could become wealthy. 300 thousand prospectors came to California during the gold rush. But many didn’t even make it that far. Travelling across the United States with wagons made of wood, it was easy for something to go wrong, especially in remote areas. The journey was so dangerous some chose to go it by ship, sailing all the way around South America to reach the west coast. For most the journey would prove pointless. Few would find gold and even less would find enough to get rich. While those few lived like 19th century gold rush pimps – the thousands of less fortunate prospectors were basically just losers in the desert digging sand. When gold was found, prospectors would set up camp in the area. Depending on how much was found and how many prospectors arrived, camps would develop into small boom towns. Some boom towns flourished while there was gold or silver to be found. They had large populations and saloons and brothels and churches. Their growth was fueled by gold so when miners in the area stopped finding it, boom towns were usually just abandoned. And so the wild west was left with dozens of ghost towns, slowly being reclaimed by the desert. One of such was Bodie, California. Bodie was founded in 1876 and within a few years had a population north of 5 thousand. Millions of dollars worth of gold was mined in the areas around Bodie. It’s said that by 1880 she was California’s second largest settlement. Almost ten thousand called Bodie home and the town boasted of 60 Saloons – one of which was run by a woman known as Madame Moustache. She led an interesting life, being one of the old west’s most notorious gamblers. Her nickname came in part from her working as a madame, apparently employing the best prostitutes in Bodie. I’m not entirely sure but the other part of her nickname might have had something to do with her having facial hair. It’s possible. After racking up gambling debt she commit suicide on the streets of Bodie in 1879. But this was hardly a shock to locals. Drunken violence, shoot outs and murder were commonplace in the ghost town. Bodie even had it’s own China town, with hundreds of Chinese miners and rail workers. They introduced opium to the area… which probably didn’t exactly help anything. So basically Bodie was like the most stereotypical old west town there ever was. I mean, it had saloons, opium dens, and shoot outs. It outlived most other boom towns of California’s gold rush, yet still declined with mining profits. By 1915 people were already calling her a ghost town but it was only in the 1940s that Bodie’s population dropped to zero. Perhaps that is why the town is so well preserved. Today Bodie has no population but sees thousands of visitors each year. According to rumour many visitors regret stepping foot in the town – not only because it’s boring but because the town is cursed. It’s said that anyone who takes an item away from Bodie will suffer bad luck until the day they return what they took to the town. Going back decades there are stories of people taking small objects like rocks or nails, only to later send them back with a letter explaining how it ruined their lives. According to legend the curse was invented by rangers to stop people stealing from the town. But they heard so many stories of misery caused by the curse that even they began to believe it. Before long the curse came to the attention of Ed Warren – a world famous paranormal investigator. He apparently taught himself to be an expert in demonology. With the field of demonology being… non-existent… no one could say he wasn’t an expert. When it came to Bodie he had an interesting theory. He believed that in the early days of Bodie, prospectors invoked some kind of supernatural force to help find gold. It worked and those who summoned the force gained vast wealth. But it left their town in the grip of evil. Some who claim to be effected by the curse report paranormal encounters – like a violent poltergeist following them where ever they go. And these aren’t where the paranormal claims end. Bodie is also said to be one of the world’s most haunted places. The old mines that surrounded Bodie are thought to be especially haunted. Legend tells the souls of prospectors who died before finding gold have since remained in the mines. In the darkest depths of mine shafts they continue to dig, in the hope finding gold will allow their soul to pass on. Few people have ever encountered these ghosts, but above them is a more notorious spirit. The ghost of a large white horse is known to sometimes emerge on misty mornings and haunt entrances to mines. Made to carry too much gold the horse died while at work. Over a hundred years later the horse can still be seen, appearing with the distant sounds of ghostly moaning and when the mist fades away, so does the ghost. Another ghost of Bodie is that of a Chinese maid who had an affair with her employer. But he already had a wife. This was a time when adultery was seen as an act of virtual blasphemy. When it became known they had the affair she was shunned and rejected by the community. Devastated by this abandonment and with nowhere to go she took her own life. Strangely, it was an entire generation before she returned to Bodie as a ghost. She is not a vengeful ghost, simply wandering the town weeping. But that’s not to say there aren’t vengeful ghosts in the area. In the late 19th century a local man shot his wife dead. He could give no excuse for killing his wife. And so, without a proper justice system, three other locals took it upon themselves to deal with him. He was thrown into a wooden box and buried alive. No other locals missed him but still he returned to Bodie soon after. One after the other he visited the men who murdered him. Within a month of each visit each man was dead. The town has far too many ghosts to list in one video. You can write your own joke about a ghost town being full of ghosts because at this point I don’t have the energy to do it myself. So that’s the story of Bodie, California. Since 19622 it’s been classed as a state historic park, to be preserved in it’s current condition. With that in mind it will remain as a ghost town for the foreseeable future. And as an increasingly notorious attraction,who knows how many more will fall victim to it’s curse. 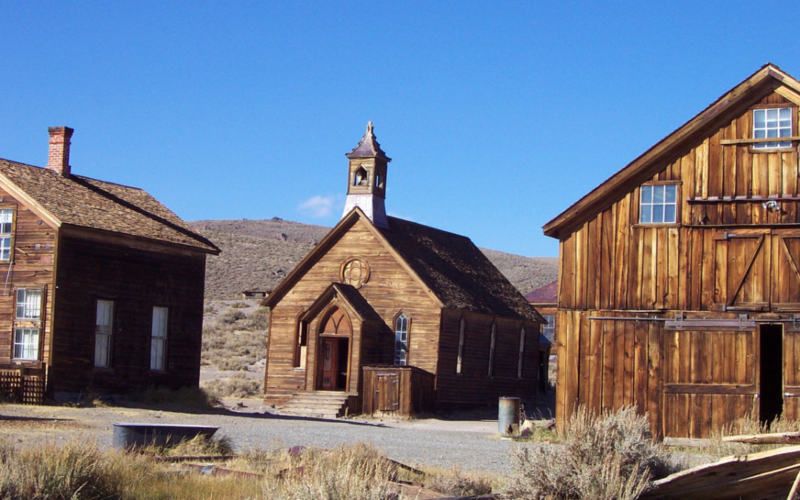 Strangely there is another ghost town in Washington also called Bodie. Both were named after the man who originally discovered gold in each location – W.S. Bodey. Both town misspelled his name for some reason and also no one knows what the “W” in his name stood for. Clearly he was a successful prospector, finding gold in two locations. But he died before being able to sell any gold, getting lost in a blizzard and freezing to death.